TWENTY new profiles are made EVERY SECOND on LinkedIn! To stand out from the crowd, technologists must have a impact-full profile. People create an impression about YOU within the first 3 to 4 seconds of landing on their profile. If your profile connects with clients, they will want to contact you and do business with you. What if you are not getting your desired results? 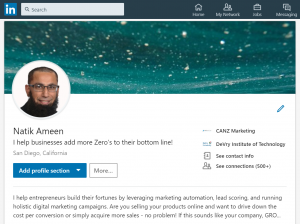 How to promote yourself on LinkedIn? People should be able to recognize your profile headline in an INSTANT. Your headline should summarize your specialty. It should say something about what service or product you provide. You should also assess and update your profile on a regular basis because an up-to-date and attractive profile tells that you’re open and ready for business. Your updates should be brief, sweet and spicy. Remember that you only have a few seconds to convince people to click on an update, so you should tell them exactly what they can get from it. Try to use 150 characters or even fewer that add spice to your update. You can start a discussion or ask a provocative question. Create a better impression using your profile photo, publication links, SlideShare and LinkedIn’s File Upload feature. Your profile photo should be professional-looking, friendly and clean. A beautiful profile photo followed with a concise, but interesting headline makes people want to stop and learn more about you. Include your best guest posts, free ebooks and guest posts in your profile as Publication links. This will create a portfolio that visitors can use to determine your competencies and expertise. You can also upload files to the profile Education, Summary and Experience sections to provide a first-hand proof of your proficiency and experience. Use SlideShare to make information slideshows. It can be about the presentations you have authored, the campaigns you have made or the web pages you have designed. Visuals such as videos, links, screenshots, slides, logos, and photos can help you capture the attention of your audience. It also allows you to design and organize interactive and visual content. Your profile summary is your chance to convince potential clients why they should do business with you. How can they work with you? Your profile summary should explain these things and showcase your desire for continued improvement and growth. Your summary should be somewhat PERSONAL as the readers will want to know your mindset and voice. Use your profile summary to convey your goals and highlight your skills. Strike a conversational tone to attract more readers. When requesting a new connection, make sure to write a powerful introduction message. This is a great way to build CREDIBILITY AND TRUST. Your introduction message is your chance to let your potential connection know who you are, why you want to connect to that person and what you do. Make sure to explain all of these in less than 300 characters. Follow these tips to increase your visibility and credibility on LinkedIn!